In-Sync Exotics was excited that Sam and Kodi was not the usual rescue that we were accustom to. We are honored to have been chosen for Sam and Kodi’s final home. 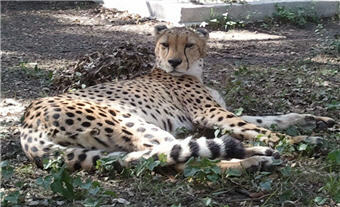 The pair of brothers came from an AZA facility that focuses on the conservation of cheetahs. These two are not part of the breeding program due to congenial medical problem that causes them to have uneven gait. 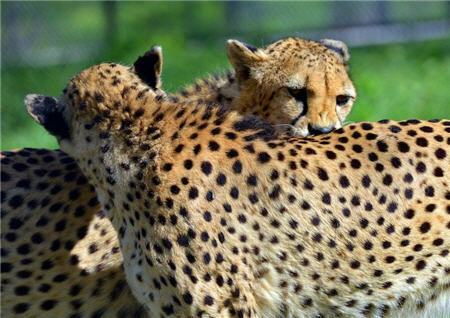 This malady is not considered advantageous to the cheetah as a species; therefore they will not be used to produce offspring. A multitude of test has been performed by the AZA facilities and they have never been able to find out what has caused their condition. Sam is more outgoing than his brother and seems to be the leader of the two. Sam is also more food aggressive and readily takes the treats we give him. We offer bones to all the cats on Wednesdays and Sundays and Sam will take his, and then run to a private area of the enclosure to enjoy his feast. Kodi does the same but will choose the closest area where he contently works away at his new prize. Kodi loves to come to the fence and talk to his caregivers. Both boys seem to be a little reluctant to have people around but we hope to be able to help them adjust by introducing them to our training program. 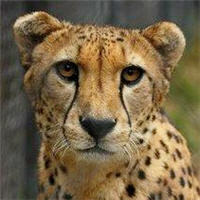 In April of 2012 we hope to start building them their new permanent 13,000 square foot enclosure complete with climate controlled indoor area and everything outside that a cheetah needs to feel at home. 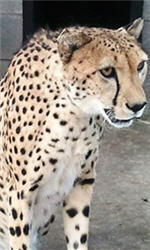 To learn more about cheetahs please visit our education page. Cheetahs really are a different kind of cat.